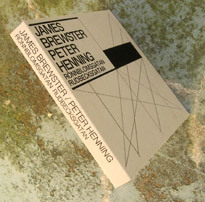 A 15 minute edit from over three hours of improvised play, the ‘Rönnblomsgatan Rudbecksgatan’ EP 3" CDr by the Malmö-based duo of James Brewster and Peter Henning is a wonderful sampler of the pair’s collective approach to post-production reconstruction: five tracks titled for their length in seconds, the pieces materialize out of fragments pushed to their sonic ends, such that the brief skronk of “94” bats back and forth as it skips channels, coughing and sputtering timbres only a machine could love; yet despite its chop, the regular return of central sounds adhere the piece into a practically perceivable melody. The airy “95” employs many of the same jumps, yet with greater open space which reveals a charged static leading into the central “444”: with a high-speed, insect chirp, the track’s lead tone oscillates bpms in an erratic groan given to showers of feedback as it wrenches into other gears; with the ambition of Francisco Lopez, the artists tear through the whole bag’s worth of tricks in little time, expressing the discipline and attention to detail of an Extreme lifer. “66” exits the lofty centerpiece with a similar crackle to that which entered it, piercing the senses before last piece “177” whacks the ear with paddle claps, steel drum thunder, and crisp electronic insertions. Though the format suits this production well, a full-length from this pair will likely reveal equally phenomenal results. In a hand-assembled, razor-cut sleeve printed on heavy paper.